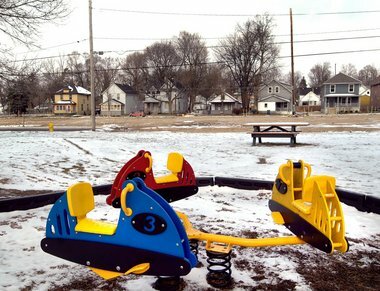 GRAND RAPIDS â At first blush, the $106,000 gift from the Richard and Helen DeVos Foundation for Joe Taylor Park in the gritty North Baxter Neighborhood might seem surprising. But the Amway Corp. co-founder’s entrepreneurial roots can be traced to the corner of Baxter Street and Diamond Avenue SE, where the city is expanding the inner city park. That is where Adrian DeVos, Richard DeVos’ Dutch immigrant grandfather, opened a grocery store. Behind the storefront in a house with three rooms and a bath, Adrian DeVos raised a family of seven children. DeVos family members occupied the house until the mid-1950s, when it became a storefront church. The building was torn down 12 years ago after it was abandoned and damaged by arsonists. “We are thrilled that the DeVos family is making this investment in the community,” said Steve Faber, executive director of Friends of Grand Rapids Parks. The new park is located in a neighborhood that was among the most deficient in green space areas, Faber said. City commissioners on Tuesday approved a $500,000 contract that will transform Joe Taylor Park into a 2.2-acre recreation area. It will feature a water park, restrooms, a picnic shelter and playground equipment. Besides the DeVos contribution, city officials said the project receive funds left over from the wall reconstruction at the Fulton Street Cemetery. Faber said Friends of Grand Rapids Parks is now raising funds for an endowment that will provide future maintenance and improvements at the 2.2 acre park. The DeVos connection will be noted when the new park is dedicated next year, Faber said.